In a house with picky eaters I am always trying to find ways to take our favorite recipes and revamp them in a healthy way. 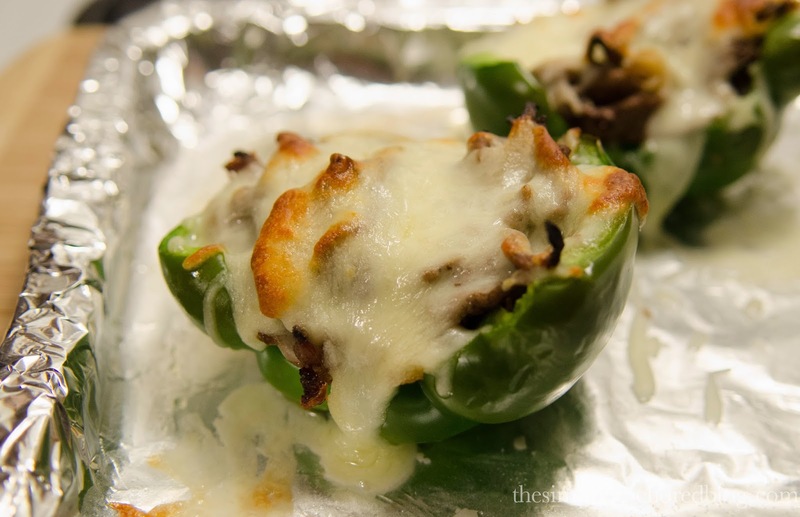 One of my husbands favorite meals is a yummy, gooey, meat filled Philly Steak and Cheese. My original recipe I lightened it up but it was still carb filled. This time around I decided I would cut out all the bread and mayo and stick to the basic elements. I was a littler nervous that my husband would look at it and scoff, but he didn't! He actually enjoyed it. Success. 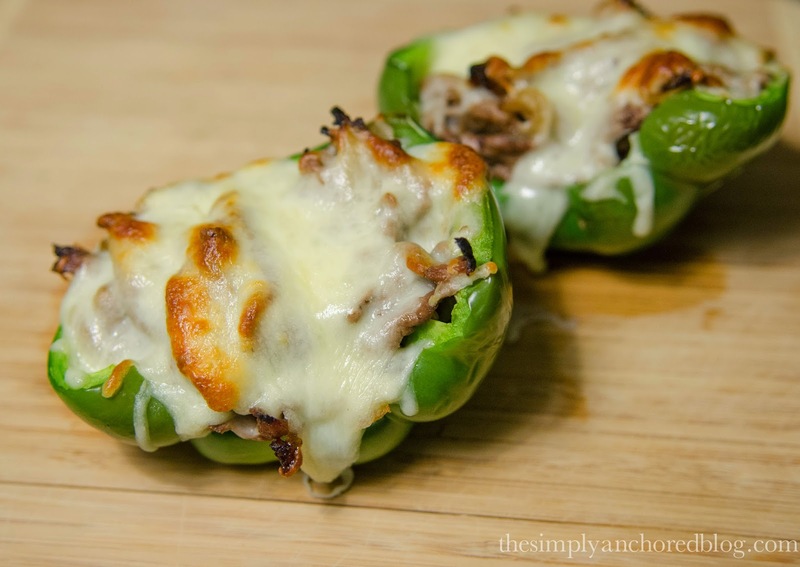 This recipe is super simple and only uses green peppers, minute steak/shaved steak, onions, evoo, and mozzarealla cheese! To view the full recipe scroll to the bottom. 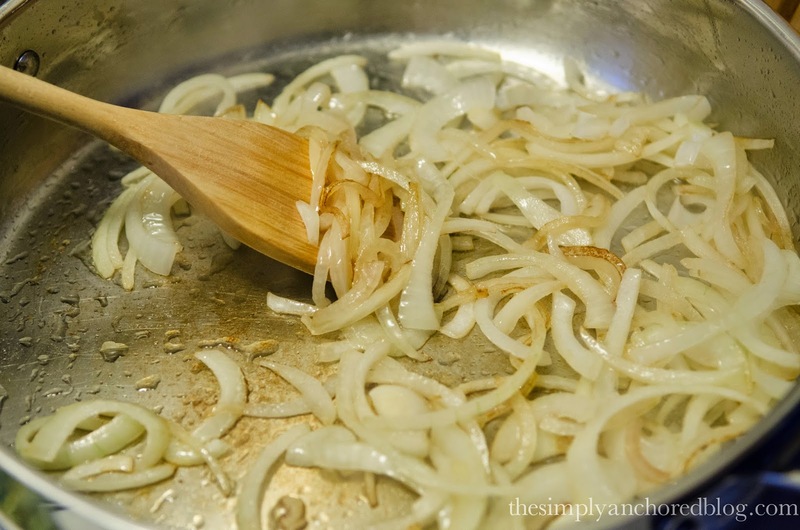 You're going to want to take a sweet onion and cut it into this strips and sauté them in he evoo, on high, until they are translucent. 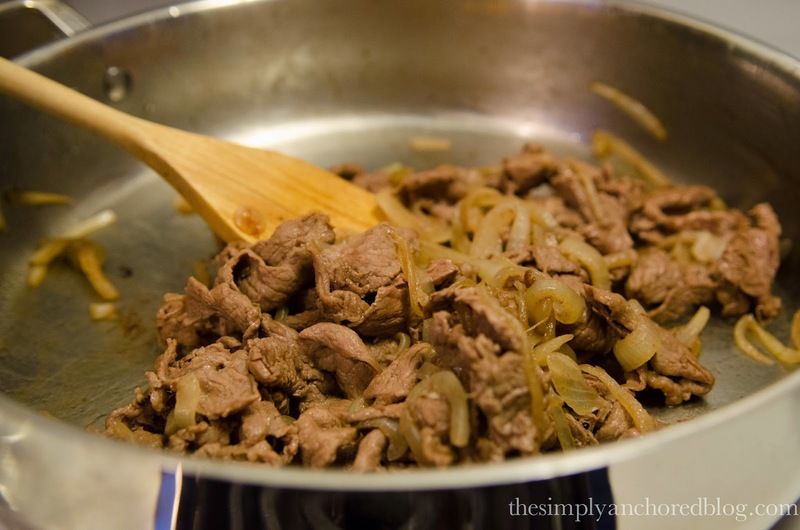 Once the onions are cooked, add the steak. I usually tear mine into smaller pieces, but it all depends on what size it comes in. I just find it makes it more enjoyable to have smaller pieces instead of a deli meat size piece. 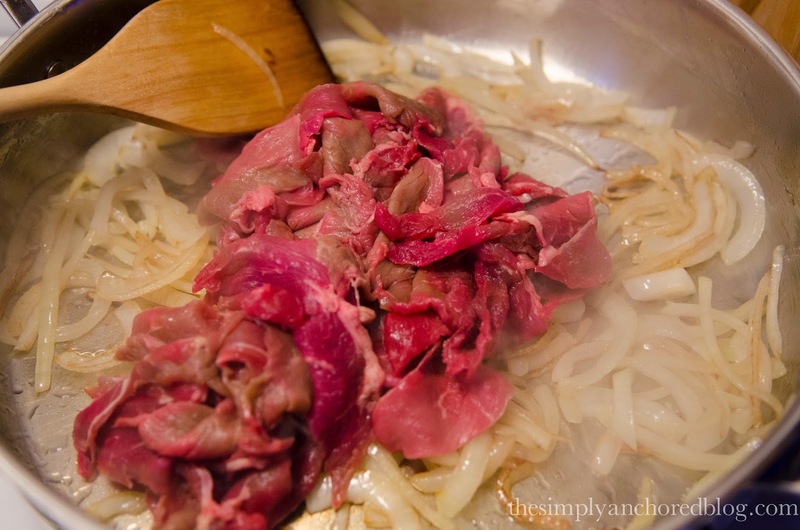 Add the steak to the onions and cook until it's no longer pink. Keep stirring it around because it will stick to the pan. Preheat your oven to 375º. Cut your green peppers length wise and take out the seeds and ribs and lay on a baking sheet. You're going to take some of the mozzarella (or cheese of your liking) and line the inside of the pepper. Take the cooked onions and steak and fill 'er up! Pop in the oven for about 15-20 minutes. 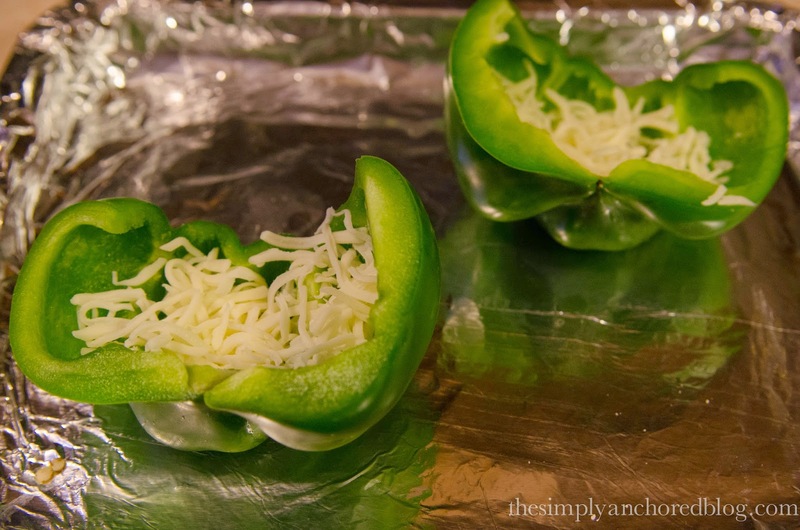 If you want the peppers to be a little softer you can add some water to the pan and cover it with tin foil to trap the steam. Voila! Healthy, no bread, steak and cheese! This looks delicious!! 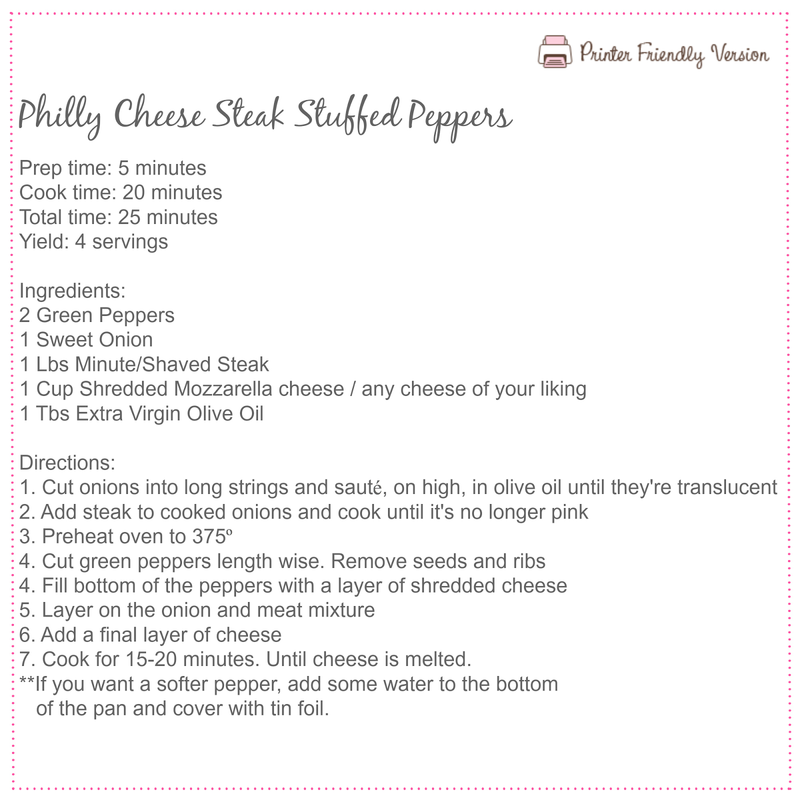 I love a good cheesesteak as much as the next person and I cannot wait to try this! Have you tried it yet? I'd love to know how it turned out and if you made any substitutions! OH MY YUM! 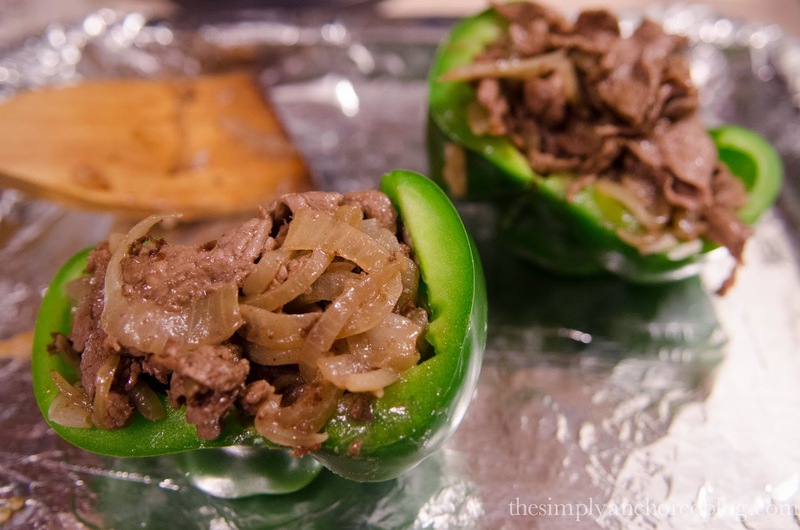 I am totally making this and doubling it (I know my boyfriend will eat more than two peppers on his own!). I may use roast beef since I can never find shaved steak in my store. Is it frozen? Or do you find it fresh? About how many calories in each pepper? Is the container count per each half pepper filled? We are starting the Fix soon so I am working on Meal planning and am excited about this recipe! 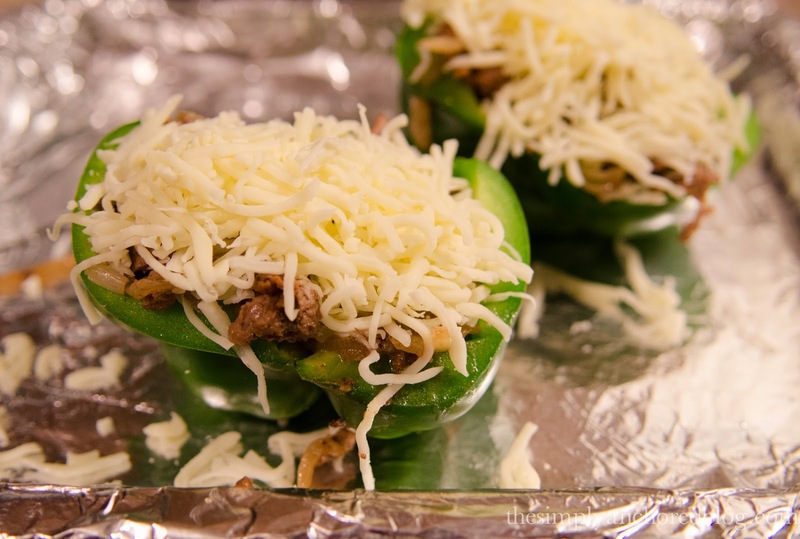 Mouth watering Philly Cheese Steak Stuffed Peppers! That looks healthy and taste good, thanks for sharing it.You can try Sargento a 100 % real and natural cheese for your ingredient. 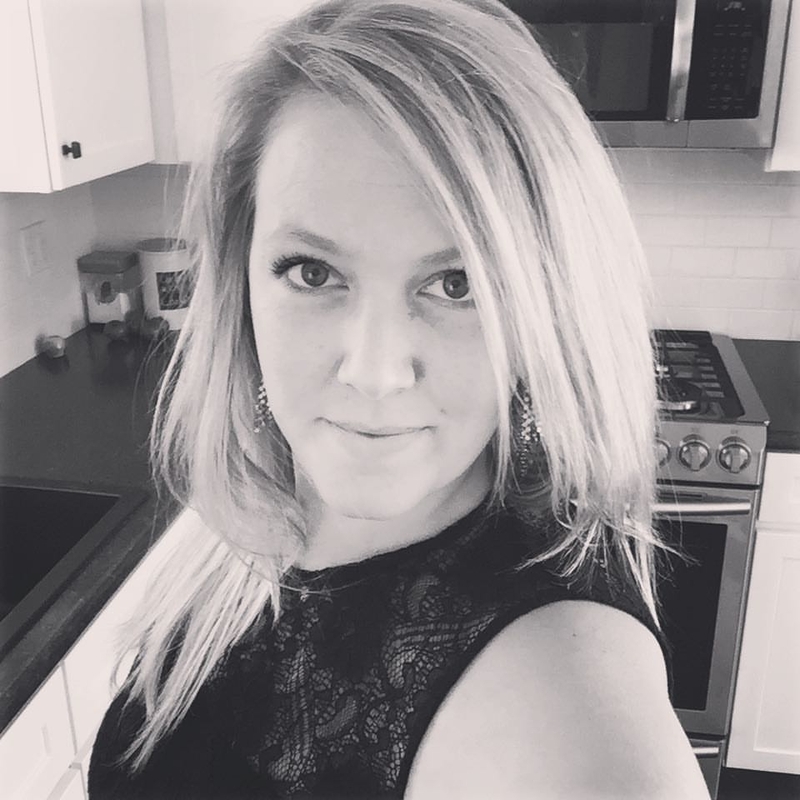 Is the 1R,1B,1G 21 day fix tally per serving? when i made this thoe other night i think the container count would be that for one whole pepper...i measured it out and one pepper depending on size can hold one container of the beef and then the peper i would think would be a green and the cheese would be a blue...that was my thoughts when i made this....it turned out very good and is great to reheat. That's got to be more than 1 blue of cheese in each Pepper half. I love these! I saute some mushrooms with my onions and steak because I love them-but I know not everyone is a fan. Delish! Just made these for dinner tonight. Added Bananna peppers to mine. Turned out great! Is it one pepper per serving? Including the onions? We made these tonight and they were pretty good. Our peppers were thick so I used the tin foil and water to help make the peppers softer. They were still fairly hard and not very hot. I think I'll try roasting the peppers before hand next time. I also added some worschestershire sauce and Italian seasoning. Thanks for the recipe! This was delicious! I used red peppers instead of green as I like them better. Also, I brushed the peppers with olive oil and cooked them first at 400 degrees for 15 minutes to soften them up before stuffing them. I cooked mushrooms with the onions & meat to add even more flavor and used grated cheddar cheese instead of mozzarella. Will definitely make them again! I love this dish. Not only is it delicious, it's quick and easy to make. This is the second time I have made it, and my family loves it. Thank you for sharing this recipe. Am Dr omair. I specialise in helping people with their problems such as. 1 spell to increase your money. Contact us at (indianspellcaster@yahoo.com OR WHATSAPP ON:: +18679887328) your solution home!